THE DRIVE BY II CORPS in the San Pietro area was to be accompanied by a full-scale offensive on the part of VI Corps in the mountains to the north (Map No. 21, page 68). As in Phase 1, the main effort in this sector was made along the two east-west roads, but this time the fighting would spread over a wider area. Ultimate objectives, to be reached as the offensive continued into Phase III, were the heights north of Cassino at the head of the Rapido River Valley. Ten miles of rugged mountain country lay between VI Corps and these objectives. For the opening attack, the French 2d Moroccan Infantry Division, which had relieved the 34th Division on the right flank, received the mission of taking the high ground east of Cardito, overlooking the Colli-Atina road, while the 45th Division on the south was ordered to launch a secondary attack to gain dominating terrain east and southeast of Casale on the first stretch of the road to Sant' Elia. 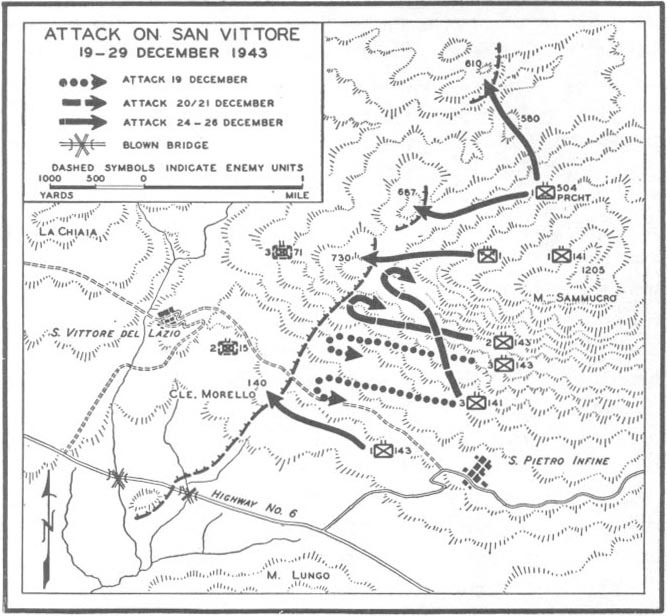 The day set for VI Corps' assault was 15 December. but the weather permitted extensive air missions in front of VI Corps, during the five days preceding the drive of the 15th. Throughout this period, as well as during the first few days of the offensive, principal targets of our aircraft were enemy-held towns on the main roads as far west as Sant' Elia and Atina, a forward supply point at Viticuso, German gun positions near Cardito, and the road net behind the enemy lines. These roads were pounded all day on 14 December by P-40's in preparation for the corps' attack. posed of the, 8th Moroccan Rifle Regiment, two battalions of the 4th Rifle Regiment, and two tabors or battalions from the 4th Group Tabors, the famed Goumiers from the Moroccan tribes,3 was to move across San Michele Pass and, advancing west through the mountains by towering Mount Mare, to sweep toward Cardito. After the enveloping force had made sufficient progress, the 5th Moroccan Rifle Regiment on Knob 1 of Mount Pantano would try to clean up that hill mass and then push farther west. The 45th Division, on the left, was to make a drive toward Casale. 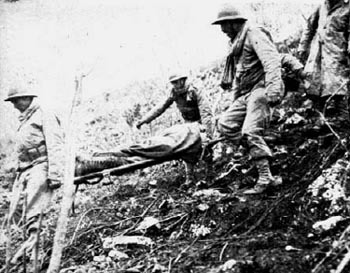 The 179th Infantry would clear the Lagone draw, while the 157th Infantry attacked along the sector from Hill 640 down to Fialla Hill just north of Concacasale. The German opposition before the 45th Division consisted of fresh units from the 44th Grenadier Division: the 1st Battalion, 134th Grenadiers, in the Lagone area and the 1st Battalion, 131st Grenadiers, south of the Sant' Elia road. 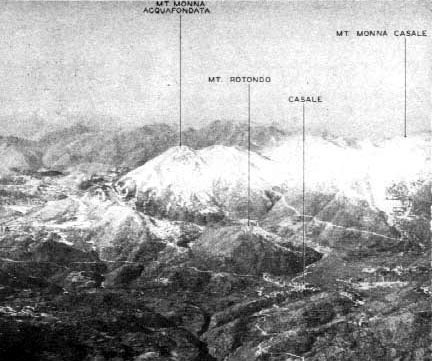 During the night of 14/15 December the French forces of VI Corps on the north assumed the offensive, and by early morning elements of the 8th Rifle Regiment had taken over Mount Castelnuovo and gone on to seize San Michele Pass. At that point, however, the French troops received heavy automatic weapons fire and were stopped in their projected flanking maneuver toward Cardito. 3. Members of a "goum" or military unit roughly equivalent to a U. S. infantry company. Three goums make up a tabor, and three or four tabors combine to form a group. Highly skilled in both mountain and desert warfare, the Goumiers are noted for the fierceness and speed which characterize their operations. In addition to their native knives, they are armed with light infantry weapons. The Goumier is an individualist, difficult to lead but fiercely loyal to trusted officers. on our part might be expected to produce a swift counterattack along the sunken trails of the district. The 1st and 3d Battalions of the 179th attacked at 0630 on 15 December after a ten-minute preparation by the 160th and 189th Field Artillery Battalions. While the 3d Battalion struck directly at Lagone, the 1st Battalion moved from the north slopes of Hill 769 to take Hill 760 west of Lagone and thus threaten the German route of escape. Despite heavy small-arms fire, Company B got close to its objective on Hill 760 shortly after daylight and put down mortar fire on the hill until the enemy was eliminated. The company then moved up to consolidate its gains, and Company A dug in on a little knob to the south of Hill 760. In the 3d Battalion's attempt to take Lagone, Company L reached the north edge of the village by going around a low knob, called the "Pimple," but neither it nor Company I on the south was able to take the objective during the day. Both companies pulled back at nightfall. of Pantano where casualties could be evacuated to hospitals. During the night Company K started around to the left of Company I to take Lagone from the west, but a heavy artillery barrage from enemy guns completely disorganized this flanking force on the north slopes of Hill 769. Nevertheless, the Germans were sensitive to the threat in their rear and evacuated Lagone before daylight. Patrols of Company L entered the hamlet shortly after noon on 16 December, and our troops occupied the timbered dugouts of the enemy, some of which were twelve feet deep. On the 17th the 3d Battalion continued to advance cautiously west toward Mount la Posta against very slight opposition. Just to the north of Lagone, the fighting on 15 and 16 December brought first contact with the German 5th Mountain Division, a unit of Austrian-Tyrolian origin which had moved from the Leningrad sector to Italy at the end of November. Before daybreak on the 15th the 1st Platoon, 45th Reconnaissance Troop, went out on a volunteer mission to capture Hill 895, held by elements of the 100th Mountain Regiment. Although the enemy broke up the platoon's gallant assault, his hold along this sector was weakening. After dark a platoon of Company C, 179th Infantry, was able to take La Bandita without opposition, and the next day the Germans also yielded Hill 895 to French troops of the 5th Rifle Regiment. On 16 December the 5th Rifle Regiment, which still controlled only one knob of Mount Pantano, moved to take Knob 2. The Germans brought heavy artillery fire down on the attacking troops, but the French were also well supported by field weapons. According to a prisoner of war, our fire killed more than two hundred of three hundred men in one enemy unit. Yet the Germans could not be driven off at once. From dug-in positions and well-placed pillboxes they continued to hold the western portion of the Pantano hill mass for two more days. it went out of the line early in January. high ground on both sides of La Rava Creek. North of it, the first task was to clear a group of hills immediately commanding the road, with Hill 640 as the most prominent feature. South of the La Rava Valley the 157th aimed at Fialla Hill on the spurs of Mount Majo, overlooking the hamlet of Concacasale. on the saddle leading to Hill 470. Exposed to fire from higher ground on three sides, the 157th troops, had, nevertheless, clung to Hill 460 and had endeavored to drive the enemy off the 470 knob by artillery fire and combat patrols. After one of the heaviest concentrations of mortar and artillery fire, patrols reported on 11 December that they found "some arms and legs but no personnel" on the knob. But the Germans were back the next day and were not dislodged by night attacks on 13 and 14 December. This stubbornly held ridge was the first objective in the 157th's attack on 15 December, employing the 1st and 3d Battalions. 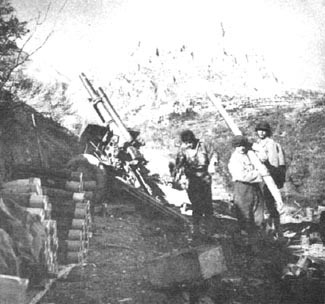 No artillery preparation was used except for smoke by the 158th Field Artillery Battalion, intended to prevent enemy observation from Mount Cavallo. Company B, backed by Company K, jumped off at 0515 for Hill 640 and was on its objective by noon. Company C launched a daylight push at 0805 toward Hill 470, supported by medium tanks of the 1st Platoon, Company A, 755th Tank Battalion, which cruised through enemy artillery fire up and down the road to the east of the hill. The tanks drove the enemy into dugouts on the steep reverse slope, and two machine-gun crews which were holding up our infantry had to withdraw. By noon our troops, aided by smoke, reached the top of Hill 470 only to be forced back to the east side by enemy artillery fire. Company C moved up La Rava Creek to get around the hill. One platoon was cut off by the Germans and no one returned. The remainder of the company came under heavy fire from across the valley and withdrew at nightfall. just after midnight, Nebelwerfer ("Screaming Meemie") fire came down on Hill 640, and the enemy regained the west slopes of that hill. On 16 December attacks by Company C on Hill 470 were again supported by the medium tanks but failed to clean out the enemy, though twenty-four prisoners were taken. By the middle of the afternoon the company was back on Hill 460. As it turned out, this withdrawal was fortunate, for at 1430, eight A-36's bound for Casale hit Hill 470 by mistake. Our infantry gleefully reported that the enemy suffered heavy casualties, but we did not launch another attack. cember from positions on Hill 759. As the leading elements moved forward, colored flares were sent up by the enemy, and his artillery began to pound the attacking troops. Company E swung south and placed one platoon on Fialla Hill by 0830, but the German guns shelled it off the hill and back to its original positions by 1600. Company G on the battalion's right attacked up the draw south of Hill 770 and cut north toward the crest of the hill, only to bog down on the southwest slopes by noon. During the night the company tried to take the rest of Hill 77o but, after running into heavy cross fire from machine guns, received an enemy thrust on the left flank which pushed it entirely off the hill. By daybreak of 16 December, Company G was back at its original positions on Hill 759 with a loss of almost half of its men and all its officers. Company E's turn came next. During the night it regained Fialla Hill; two minor counterattacks in the early morning of the 16th were beaten off with the aid of mortar and artillery fire. At 1055, however, the enemy hit the company hard. After severe fighting which reduced one platoon to an effective strength of five men, the 2d Battalion had to yield ground under the threat of encirclement. Our artillery put down a smoke screen; on the left, the mortars of the 3d Battalion, 180th Infantry, stopped the enemy's flanking thrust long enough for Company E to withdraw to Hill 759. During the afternoon three local counterattacks were made against Hill 759, but our troops repulsed them. Though the Germans had driven the 157th back from all gains except Hill 640, the pressure of our attack had its effect. From midnight of the 16th, the sector of the 157th Infantry was quiet, and the enemy artillery activity decreased. On the next afternoon our patrols on the western slopes of Hill 640 found empty fox holes and abandoned enemy equipment. The Germans had also given up Hill 470, after an almost continuous nineteen-day fight. To the south the 2d Battalion reported Fialla Hill clear by late evening. Not a single shot was heard in the drab hills before the 157th Infantry throughout the day. the corps front. Though our penetrations were nowhere deep enough to cause the enemy great alarm, the positions on which he stopped us in November had become increasingly difficult to hold as a result of our attacks; accordingly, the enemy decided to make a limited withdrawal, regroup on a new line, and thus gain a breathing spell. His retreat would also lengthen our supply lines through the mountains and bring us into new and unfamiliar terrain. Beginning on 18 December, our patrols filtered forward to regain contact with the enemy. Over hills strewn with the dead of both sides, the front-line companies followed slowly and carefully. The advance was greatest in the center along the Sant' Elia road, while the flanks of VI Corps remained anchored on Mount Corno and northwest of Castel San Vincenzo. During the night of 17/18 December the 180th Infantry, moving through the 179th Infantry, occupied Mount la Posta without opposition and pushed along the Sant' Elia road to the hills just east of Mount Molino and Mount Rotondo. South of the 180th, Company A of the 157th Infantry early on the 19th occupied Mount Cavallo, and although the troops were subjected to German artillery and small-arms fire coming from the northwest, they held their position. On the north the 2d Moroccan Infantry Division also advanced, though not so far. The 5th Rifle Regiment, which had taken Knob 2 of Mount Pantano, had been held up in its further advance by the presence of strong German pillbox positions, some of them inaccessible to our artillery fire. The French troops, nevertheless, had continued their assault, and supporting artillery had shelled located strongpoints. Late on the 17th it became apparent that the Germans were evacuating their positions on Pantano, leaving only small holding forces to cover their retreat. On the morning of the 18th, after a night in which only patrol contacts were made on the western slopes of Mount Pantano, the 5th Rifle Regiment occupied the rest of the hill mass. On the same day the 4th Rifle Regiment took the Cerasuolo flat with the hills ringing it on the north; Cerasuolo itself had been left free of mines and booby traps by the departing Germans. The 11th Tabor of Goumiers was committed on the cast slopes of Mount Monna Casale during the favorable opportunity created by the German withdrawal. By 21 December the troops of VI Corps were dug in on a line running just east of Viticuso and Casale and extending up to the south slopes of Le Mainarde.